Update! New video tutorial has been uploaded and is right here. But after a good night's sleep I viewed the video and decided I should make a part 2 to the tutorial and include measurements for the tubes.. you'll have no idea what I mean unless you have read over the pattern or viewed the video! So if you plan on making the wheelchair just hold back a bit until I get part 2 done. But in the meantime you can get the parts ready! Pick up the pattern for the parts right here but please read over the special notes before starting... ok off I go to start part 2! Dear One, You need to relax! Perhaps next time you promise a pattern, you won't give a date? Then you won't feel the pressure from that calendar!! LOL We LOVE you and your work, but if you burn yourself out, we will give you fifty lashings with a stuffed toy!! Take it easy, take your time, we will all be here, PATIENTLY waiting for your completed pieces. Thank you SO MUCH for sharing your wonderful life, family, and crocheting. but, it's ok..I'm enjoying this pattern and the response to it has been so awesome! And I really have learned not to promise dates until I actually click upload on youtube then I say, "patterns on the way before the end of the day" and we all await youtube as it slowly uploads the file. I've seen it on Ravelry lately and I was wondering what was the story behing this pattern... Anyway, don't overwork yourself, no one will die if you'll publish pattern late, and we don't want you get ill! I love your patterns, they are fantastic. Greetings from Finland! Greetings from Canada.. I am Finish but was born here in Canada. Will be making my way to Finland this year to visit my family there... can't wait! oops I meant ~> Finnish.. There was something familiar in your name;) Welcome to Finland, lämpimästi tervetuloa! Thank you for sharing everything beautiful. You are so creative. 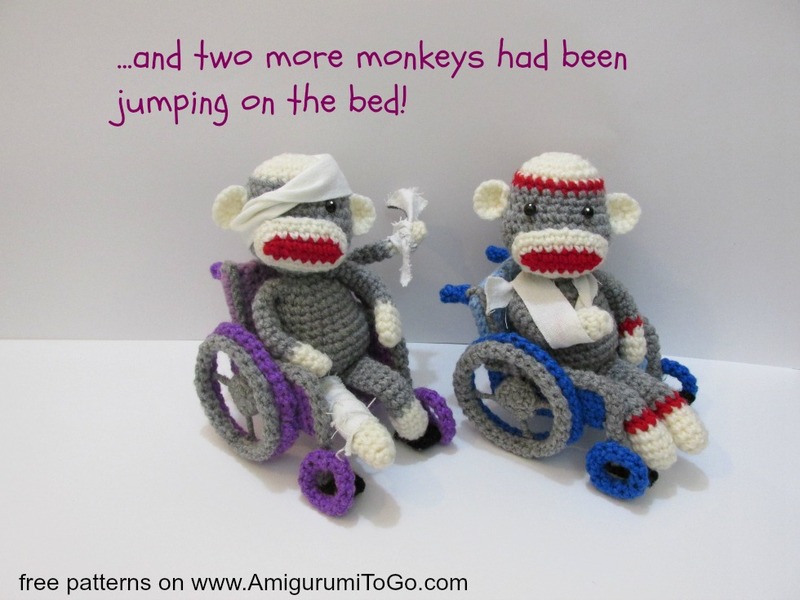 Hi Sharon, thank you very much for all of your amigurumi - I've made 4 or 5 of them, and they are all great! I especially love this wheelchair project since I have been in a wheelchair since childhood. I am currently finished the monkey and have made most of the flat pieces for the chair. I'm having some trouble with the tube pieces though because while they do become nice and narrow as I continue them, the part near the magic circle tends to stay quite chunky. This is especially problematic when I'm trying to make the handles, as they look too big and out of proportion for the chair. Do you have any tips for keeping the tubes nice and narrow like your tubes? if you are working the starting yarn tail into the 2nd row stop doing that and just cut it up a bit shorter and work around it. I don't have any tips on what I do because I crochet fairly tight from start to finish but maybe if the 1st row is the only one that's really bulky try a smaller hook for that one row then switch back to the regular hook you are using on the rest... also as the tube gets a bit longer push a pencil or a dowel into it to straighten out the tube as you work. I used to do this when I first started crocheting and found it made working in the small rounds so much easier. Hope this helps and keep me posted!